What if we could normalize conversations about sexual violence among young men? What would the world look like for survivors? What would it look like for perpetrators or potential perpetrators? How might organizations and communities transform themselves as a result? These are the questions guiding the development of The Uncomfortable Conversation, Inc., the next evolution of The Enliven Project. Our first project is rolling out a massive library of video content to support all your uncomfortable conversations about sexual violence. I’ve had a lot of uncomfortable conversations in my life, about money and wealth, political partisanship and also about sexual violence. This project will help teach you the skills you need to navigate many issues related to sexual violence ranging consent to supporting friends to addressing troubling behavior or attitudes. Talking about sexual violence might be uncomfortable, but it can also be inspiring, engaging, and sometimes downright entertaining. It’s been incredible to see how many amazing and talented people have come together around this project, and how much fun it’s been to work on it with close friends and colleagues. 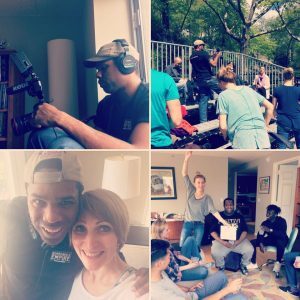 My dear friend, Russ Hammonds, and his friend, Krystle Adams, two professionals from the television and theater world, organized the New York video shoot in May. 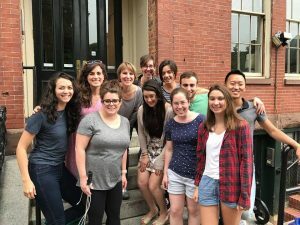 In Boston, Cara Willis, Julie Judson, my husband, Marc Beaulieu and a dozen others from the improv comedy and social justice theater community made a second video shoot happen. We’re now working with videographer Mia Malchow on editing the content into a template, so we can get them ready to share. You’ll have to wait until the launch to see the videos. But here are a couple of behind-the-scene shots from our shoots in Boston and New York. If you want to be a part of this project, learn more here. And don’t forget to sign up for our email list so you can be the first to see the videos later this summer! Actors and friends at the Boston video shoot last month. Russ Hammonds produced over 20 videos in 2 days!